Readers question: Which is better standard or compact cranks? 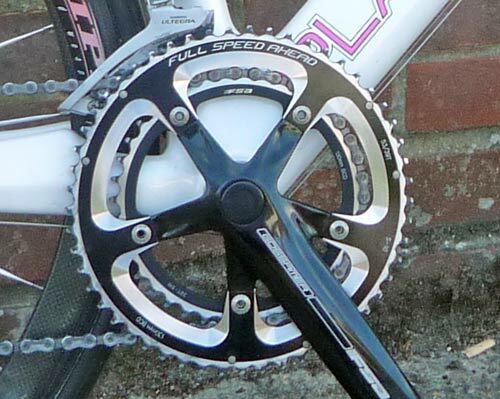 A compact chainset is typically 50/34 gearing. Standard groupsets have a PCD of 130mm (135mm for Campag) PCD Is the distance from centre of groupset to the centre of each chain wheel pin. Compact gears have a smaller PCD 110mm – this enables smaller chain rings to be put on. An inner chain ring of 34 or 36, will enable you to climb at a slower pace. A Standard gear 39*25 @ a cadence of 80rpm means you will be going at 10 mph (16 Kmph). With compact gear of 34*25 @80 rpm, you can go slower 8.7 mph. With a compact, it means on climbs you can maintain a higher cadence and avoid pushing the gears like a weightlifter. This is important in long rides where you want to prevent your muscles being overtaxed. 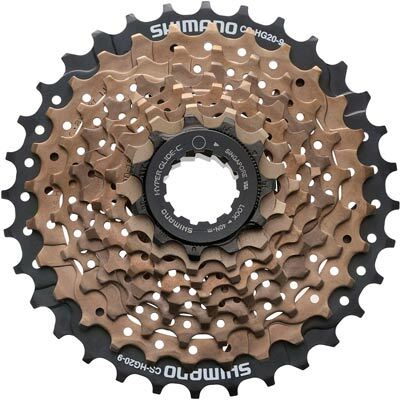 Compact gears were developed by MTB producers seeking to reduce weight (Having a compact chainset avoids the need for 3 rings), though the weight gain is relatively minor (perhaps 100 grams). You rarely regret having too many gears. You will regret struggling up a 25% hill when you’re legs are tired and you have to maintain an impossible cadence of 50rpm and are weaving all over the road to try and make it to the top. There is some loss of efficiency with compact cranks. A standard crank uses a larger chain ring and larger rear cog than a compact does at same speed for cadence. This means the chain is less tight turn resulting in lower frictional losses. The chain is engaged over more teeth for cadence with standard cranks. This makes a more efficient connection between chain and sprockets. If you’re training at 17-20mph, then you can stick in the inner ring, with a wide choice of gears. If you have a compact, you will find yourself shifting between rings more commonly. In one hill climb, I actually put on a single 45 chain ring to avoid having to shift between a 39 and 53. I have a compact chainset on my NY Bike. I don’t mind too much, but it takes a bit of getting used to, and I end up changing front chainring more often, which is a harder gear change. You could just put a bigger cassette on the rear wheel to get a lower choice of gears. Rather than using a compact inner chain ring, you can get a big reduction in gear size by using a bigger rear cassette. The cassette above has a 32 sprocket. 12-28 cassettes are quite popular these days. Suppose you put on a 28 cassette on your standard gear set. In other words, you can get a lower gear ratio by using a 39*28 rather than compact of 36*25. Which Gears Are Best for Me? Compact Gears come into their own for long hilly sportives. Compacts are good for rides where you spend all day in the saddle and face long and / or steep climbs. It is better to err on the side of caution and have lower gears. You won’t suffer because you spin out on a 50*12, but, you will suffer when facing a 25% climb at the end of the day, and you need to keep a minimum speed of 8mph or very low cadence. It is one thing to sprint up a 20% hill when you’re legs are fresh. It’s another thing to climb a 20% hill when you already have really tired legs. 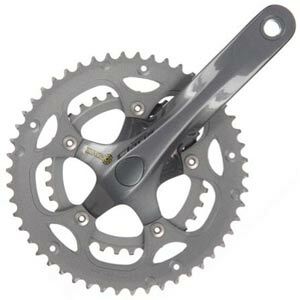 If you are reasonably fit, and are doing hilly time trials or hill climbs, I would say that a standard chainset will probably be the best choice. The lowest gear of 39*25 should be enough for all but the steepest climbs. In hilly time trials, you are unlikely to meet many climbs over 20%, and even then it will not be for long. 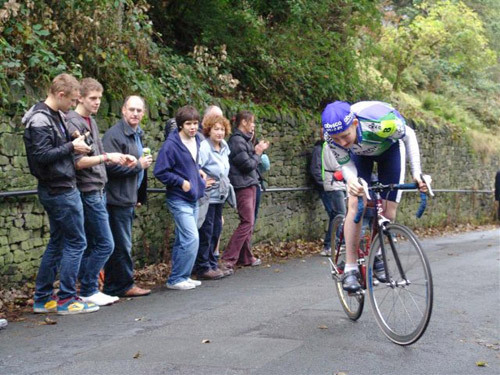 Some hill climbs are exceptionally steep, like the Rake, but for short bursts you will be able to use a standard crank. (For fixed gear bikes, it is traditional to use a 42 chain ring). To give an example, when Jeff Wright set the course record of 2.16.9 in 1993. He rode a 42×19 with 180mm cranks. If you are slower, you will be able to manage on a 39*25. It depends on the kind of terrain you will be meeting. If you did Fred Whitton Challenge you come to Hardknot pass with 100 miles in legs. This is really steep (30%). Many riders may not only need a compact (50/34 )- you may even need a triple chainset (50/36/26). I think for most riders doing a sportive like the Fred Whitton Challenge, you would want at least a minimum of 34*28. For training rides, I try to use a 11-28 cassette. This kind of prevents the need for a compact, even on really steep hills. I don’t think, I would get up in a 39*25. But, the 28 gives a lot more leeway. It may need a triple chainset. Photo: Bob Muir – from the Rake Lancashire (25% gradient). It is easy to think, I must use the same gear ratios as the top pros. If it’s good for them, it must be good for me! But, it doesn’t work like that. The marginal loss of efficiency from running a compact or triple chain ring is minimal. But, the embarrassment of falling off the bike, because you can’t pedal up a steep hill in your 39 tooth is pretty big. 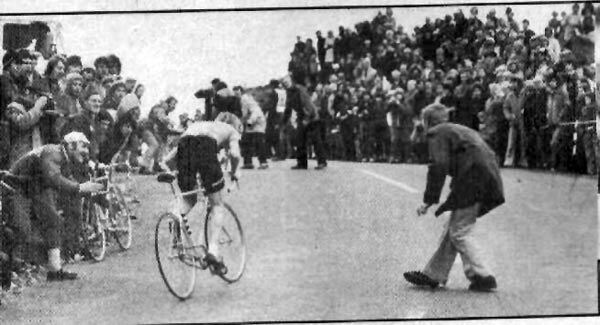 When the national hill climb championship was held at Rosedale Chimney (33%) some competitors did fall off at the steepest part, simply because they were over-geared. Believe me it’s not a nice feeling being over-geared. At the end of the day, the best thing is to know your strengths and see what gears you need for getting up hills. If you are struggling on a 10% hill in your lowest gear, and you’re off to do a 20% hill – you will know you need something lower. Gear ratios show how far you will travel with one revolution of the pedals. The cyclist in the respective picture, seems to be pushing the handlebar instead of pulling?